Watching Durham Bulls Baseball: Dirk Hayhurst — “Efficient” Win? Although the Bulls won this game, with the rainout on Tuesday and the Gwinnett Braves on a 5-game win streak, they are only 1/2 game in front of the Braves in the South. Looks like the South Division is going to keep on being a tight race all year. To be honest about it, I forgot that it was a day game and missed all of it. So what I know is from the wrap and the box score. Still, a look at those results is pretty interesting. Dirk Hayhurst had a six-inning, shut-out, one-hit appearance. Time to acknowledge that he is having a very good year and winning a lot of games for the Bulls. Even with his stretch on the disabled list, he is just behind Alex Cobb in a number of pitching metrics for the Bulls. New guy Daniel Mayora played third base, drew one walk, but was hitless. That was true of almost all of the Bulls. Only three hits, but a bunch of walks (7). In fact, the winning run was walked in after Leslie Anderson walked, Brandon Guyer singled, Dan Johnson walked, and Felipe Lopez walked. Along with his home run, Lopez was the offensive star of the game. Desmond Jennings came in the game in the 8th for Anderson. I didn’t hear any commentary on his injury status. The Bulls play a double header today with the first game starting at 6:15. The other day I mentioned a Dirk Hayhurst blog posting that mentioned, somewhat in passing, the idea of pitching efficiency being a good thing and that there didn’t seem to be a metric for that idea. I’m certainly no sabermetrics guy, but it seemed to me that it should be fairly easy to come up with a metric that measures efficiency, fuzzy as it might be. 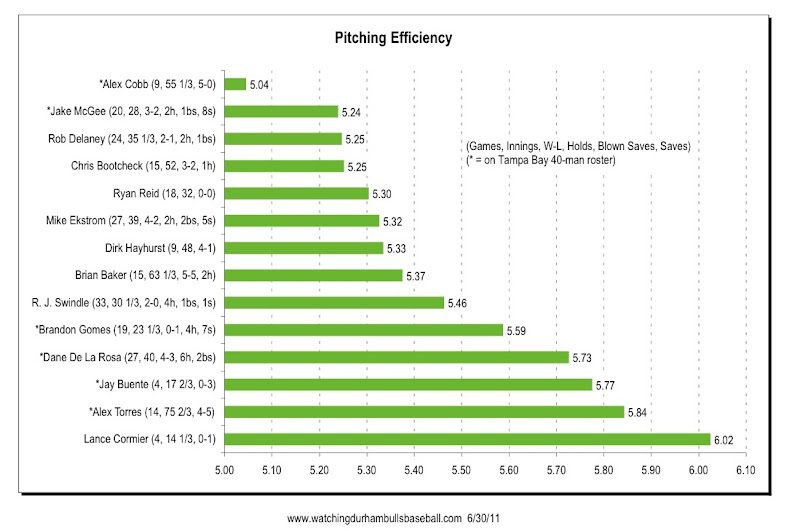 First, lets agree on what “pitching efficiency” means. Essentially, for this item, I’m just going to say that the fewer pitches a pitcher has to throw, the better. That is, if a pitcher can get out of an inning in three pitches (popups, grounders, etc. ), he is as “efficient” as he can possibly be. So, a metric for pitching efficiency is pitches per out. 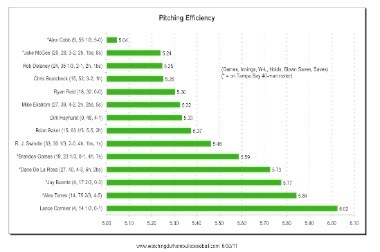 A perfectly efficient pitcher would have an efficiency rating of 1.00. We’ve got those numbers in every box score. And I already have 90% of those numbers in a spreadsheet. This is a fairly simple measure. Alex Cobb, for example, has thrown 807 pitches over 53 1/3 innings this year. 807/(53 1/3*3)=5.04. As with any metric like this, sample size can be a problem. However, to look at two extremes, Alex Torres has thrown 1,326 pitches and his “efficiency” rating is pretty high (i.e., not good). Also very high is Lance Cormier, but we only have the 14 inning/259 pitch sample to look at. Nevertheless, this is a pretty interesting measure. From this it would look as if the otherwise questionable Ryan Reid has more promise that I would have thought, whereas Brandon Gomes is not quite the star I thought he was. I’ll keep at it for the year to see if something jumps out. To answer the question in the headline: At an efficiency rating of 4.89 for the game, you bet it was! For you real sabermetricians out there: surely this has been looked at by you guys. What am I missing? Oddity of the day: A family down in Florida has put 300,000 votes into the major league all-star voting system. The problem with this efficiency metric is that it doesn't punish pitchers who give up early count hits. The pitcher would have a "PE" rating of 2.0, but still have surrendered 3 runs on 4 hits. I think an effective measure would have to somehow involve BAA or perhaps BAABIP because in that example, the BAA would be .666 despite the efficiency. Chris D: Very, very good points. Here we have an "efficient" pitcher with a rating of 2.00, who's also a crummy pitcher by other measures. But stats depend on very large samples (those in this first look are probably much too small). I'm guessing that if this runs out for 2000 or so pitches the guy who's giving up a lot of runs either won't be in baseball or will have begun to balance out his "efficiency". In fact, it could turn out that a very low PE is a cue to a problem and that what we should be looking for is a middle range, say high 4's to low 6's. Still, if this were really useful, the serious sabermetrics guys would have touted it a long time ago. So I'm just going to play with it a while and see what other flaws it may have. My problem with some of the advanced pitching stats is that they can be hard to understand and even harder to explain. But more than that, for the minor leagues key data can be hard to chase down. For example, for FIP you're supposed to have a constant based on the "league ERA". But for the Bulls, which one should I use, the American League, the National League, or the International League? I use an outdated American League constant for the odd reason that what I'm interested in, and I hope readers are, is comparing Bulls pitchers. So the constant really doesn't matter. In fact, next time I might just drop it entirely. Another stat, xFIP, uses league HR rates. Again, which league? BABIP is a stat that I just can't get my head around. I'll try again someday. One that I'll be looking into in the future is wRAA or bRAA (not sure which), but that's a hitting stat. I think you could say Shields is the best Rays pitcher this year, so that correlates. I think you could argue that 4.50 -> 4.99 is a really good #. Over 5 it gets fuzzier. Great numbers! I'll display my ignorance and ask where you got the pitch counts from. I couldn't find a site, so I just went to all of this year's box scores and counted them. When I plot these again I think I'll "scale" them to ERA by subtracting 2 and see how the PE and ERA and maybe FIP compare. Also interesting that Cobb's major league PE is close to, but a bit higher than his AAA. That also makes sense. It does look like there's some connection between "efficiency" and pitching success, though. Again, thanks for these data. I sort of cheated the pitch counts. ESPN has "Number of pitches per game started" so for pitchers that only started games (no relief appearances), you can multiple that # by # of starts and get an approximate number of pitches. Some of them result in ".2" or ".5" so ESPN's a little off I guess, but it should be close enough for this. Works for me as a estimation. Tonight's first game shows up another weakness. Torres was 4 2/3 innings, 91 pitches, so a PE of 6.50. But a lot of that not on him since he should have gotten out of the inning if fielding hadn't been so sloppy. So, PE doesn't account for that. And, of course, he got the loss even though only 1 earned run. So there are problems with all of the measures in the short run. I didn't pay attention to the first game due to other stuff, but weren't there like 3 errors? You could realistically add those 3 errors to the out count because they're "not his fault", which would make the PE 5.35. Without checking it out in more detail with other samples, intuitively I like the idea. I do track errors when runners reach at least first base because that's part of the wOBA computation, but I do it at a team level, not individual. And I don't keep track of who's pitching at the time. That said, although an error is, by definition, a potential out, we have no hint what may come of it. But this is a pretty rough and ready kind of measure anyhow. In the larger picture after thousands of pitches and hundreds of outs, a few errors probably wouldn't make much difference. But it might. And it clearly has a game to game relevance.